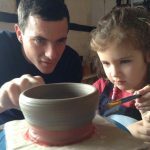 At Eastnor Pottery families can choose from our menu of clay projects including 10 minute potters wheel tasters, coil pot t-lights and colourful critter pinch pot animals. Make and take away options to paint at home, or for that permanent ceramic effect, why not leave your masterpiece with us to fire and glaze? 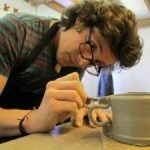 Your creation can be collected from the Pottery a few weeks later or posted to your home at cost. Prices £5 – £35 per person. 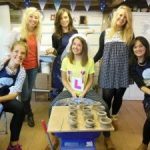 Regular workshops for children are held in the school holidays including a go on the potter’s wheel or working with coloured slips. 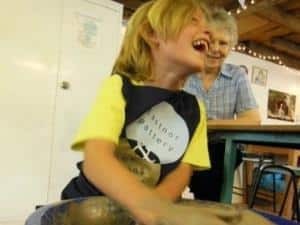 Kids’ birthday parties are offered where party goers make pottery keepsakes and a commemorative, collaborative pot for their birthday boy or girl. Educational projects for schools and early years are also available. We also cater for large family groups and special occasions such as hen parties or office away days. Complimentary cuppa or drink of juice when participating. Customers are welcome to bring their own food to be consumed on the picnic tables and benches provided. 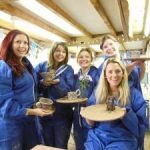 And if you are unable to visit the Pottery, The Flying Potter would be delighted to deliver the Eastnor Pottery experience to a venue of your choice! 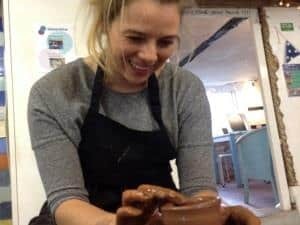 Eastnor Pottery and the Flying Potter is located in the idyllic Herefordshire village of Eastnor, two miles East of Ledbury on the A438. Turn into the village and follow signs for Eastnor Castle Car Park. As the road bends to the left, turn right and we are 100m up the track. NB. 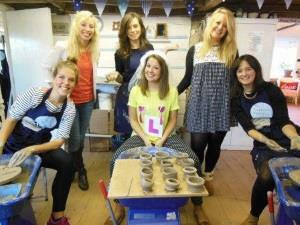 Creating things from clay at Eastnor Pottery and the Flying Potter can be a messy business. Please dress accordingly. The clay does wash out but princess dresses and Sunday best a definite no no! Disabled access with dedicated parking. In the Summer please bring a picnic to enjoy on our Pottery lawn. It is essential to ring before you travel in case we have a large booking and cannot accommodate you.